Sheets, duvets—heck, even an occasional sham. We’ve made the trek through a welter of modern linens and things and come up with a collection that will have you in bed early and sleeping late. Though many poets have extolled the merits of sleep (and perchance dreams) as well as the delightful things one might do in bed, few have taken up bedding itself with the gusto of the 19th-century British poet and humorist Thomas Hood. In the poem "Her Dream" from the Miss Kilmansegg and Her Precious Leg cycle, Hood rhapsodizes not about the woman’s leg but about her velvet quilt ("A fit mantle for Night-Commanders"), her pillow ("as white as snow undimm’d"), and her pillowcase ("in the finest cambric, and trimm’d / With the costliest lace of Flanders"), before finally exclaiming: "O bed! O bed! Delicious bed / That heaven upon Earth to the weary head!" Photograph by Laurie Frankel. Soft goods styling by Christina Watkinson. And who hasn’t echoed Hood’s cry, casting down their fatigued bones and feeling that life affords few pleasures greater than the warm comfort of freshly laundered linens and a cozy bed? In that spirit, then, we take up the matter of bedclothes. Choosing from among the modern morass of mercerized this and ten-million-thread-count that can be a vexing affair. But Sumru Krody, a curator at the Textile Museum in Washington, DC, suggests that "natural dyes tend to be more stable than synthetic ones and stand up better to washing, as do natural fibers like cotton and linen." She’s also onboard the thread-count express, noting that "the more yarn you have per square inch, the more durable the textile." Once you’ve picked your thread count—–for cotton aim for the 300 to 500 realm; jersey, which is knit, and linen aren’t measured in those terms—–it’s largely personal taste from there on out. With regard to the healthful benefits of bedding, Dr. Clete Kushida, president of the American Academy of Sleep Medicine, reports that "there is no evidence that one bedding is superior to another," but notes that the Stanford Sleep Disorders Clinic, where he works, does make use of "premium cotton sheets." 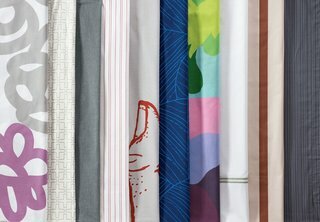 Our picks range from exuberant bursts of Marimekko color for the after-hours maximalist to Unison’s understated pinstripes for those who prefer their beds as bastions of soporific calm. And though the duvet cover from Third Drawer Down is soft as can be, artist Ed Templeton’s design is razor-sharp. So whether you like your bedding witty, whimsical, or whitewashed, this assortment of modern sheets and duvet covers will have you composing ballads each night as flights of angels sing thee to thy rest.